Peel onion, cut off top. Place cut side down onto a cutting board. Continue slicing between each section until you have made 8 cuts total. Place sliced onion in ice water for at least 2 hours / overnight. Remove from water, pat dry. Open onion so are exposed. Beat eggs with milk. Place onion on a tray or in a bowl. Sprinkle onion generously with flour mixture. Make sure to get in between all â€œpetals.â€ Turn onion upside down to remove excess flour. Using a ladle, ladle the egg mixture into every crevice. Lift up onion and turn to make sure excess egg drips off. Place the blooming onion into the Fry Basket of the Power Air Fryer XL. Cover the top with aluminum foil like a tent. Place the Fry Basket into the Power Air Fryer XL. Preheat the air fryer to 360F. Then place the onion in the basket and cook for 10 minutes. Leave foil on. When timer is done, check crispness of the onion. Cook 5-10 more minutes to desired crispness. I don’t see the amount of olive oil in the ingredients list. Could you provide that to me? Its optional but a tablespoon or two makes it taste a ton better since the air fryer tends to make foods without natural oils a bit dry. 3 teaspoons olive oil. Read it again. In the recipe it says OUR. Is that supposed to be flour and how much is used? Technical error, or maybe user error 🙂 Thanks for pointing it out. The recipe calls for flour in the instructions but it is not mentioned in the ingredients list. How much did you use? So glad to find your website! I just bought both books, thanks!! Followed recipe, it was a mess. Inedible. 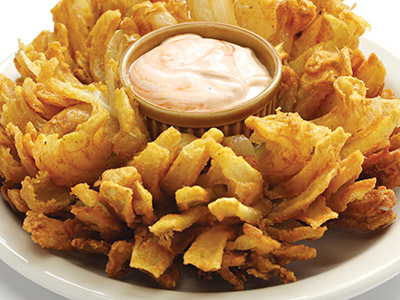 What kind of sauce is served with a Blooming Onion? Hi, sorry to hear that. We have had a few people with issues with this recipe. It looks like we need another revision.